Home / Editor's Choice, Entertainment News, Forum and discussion, Gossip and Drama, Lifestyle / Pride Comes before a mighty fall-Gospel singer BAHATI told after he wrote this about his wife DIANA MARUA. Pride Comes before a mighty fall-Gospel singer BAHATI told after he wrote this about his wife DIANA MARUA. 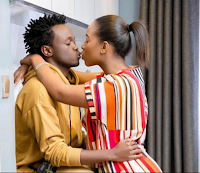 Sunday, March 10, 2019- Controversial Gospel singer Bahati is on the receiving end on social media once again following his message to wife Diana Marua as the world celebrated International Women’s Day. In his message, Bahati stated several reasons as to why Diana Marua was his greatest woman on the Women’s Day. Read his post and check out some comments from netizens. 1. First is to Thank you for your Love, Maturity and Patience in our Marriage. I Understand it's not any easy for any Woman to date a Man that is Making headlines every Week in this ERA & Season that blogs Write Stories without Verification or Proof. But Sweerie thank you for Understanding that my Calling as a Public Figure I must go through this Coz no Real Success that's Never Tested. (Alafu Pia ni vizuri Uelewe Juu Mpasho na Tuko News wasiponiandika Watakula Nini??? Unataka Wafunge Ofisi???) Najua the More I don't respond they try to Touch you to reach to Me But please NAKUOMBA UNIVUMILIE. 2. Lastly; I Know I've never told you this but KUDOS for Loving me for who I am or Rather Who I was. Diana Apart from Taking care of my Son Morgan you Closed your eyes to my Past took me as ME. Thank you for Accepting the fact that I had a First Born Daughter #MUENI @mueni_Bahati.